A con man sets out to swindle a widow out of the money she's received to build a memorial to her war-hero husband, but winds up falling in love with her instead. Every bullet in Chicago had his name on it! William Castle directs this dandy little noir thriller. Tony (Scott Brady) is the perfect patsy. He's an ex-con and the Chicago police are more than willing to believe the worst of him. So, when some unknown people kidnap him, shoot him and set him up for his future father-in-law's murder, the case seems pretty air-tight. However, like so many noir films, he investigates the case himself and aims to prove his innocence. Along the way, he gets the help from a nice lady and even from a cop. 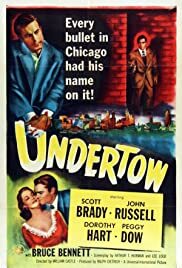 "Undertow" is an excellent and enjoyable film. While Peggy Dow's character makes no sense (why would anyone help a wanted man when they barely know them?! ), the overall story is quite well made and keeps your attention. It has some excellent twists and the acting is quite good despite the actors mostly being second-tier. It sure helped having the excellent director William Castle in charge, as he had a habit of making the most of lower budgets.